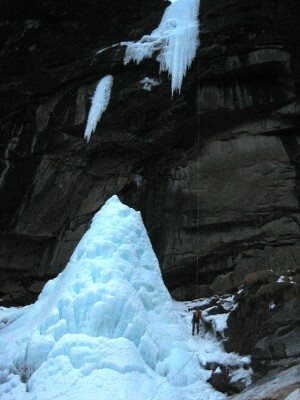 During our recognizance of the valley one climb stood out as particularly stunning with lots of steep ice above a big cave with a large non-connected dagger and cone. At first I thought that we would not have a chance of getting to the great ice above the cave (neither Carsten or I can climb M10 or whatever it would be to climb the cave! 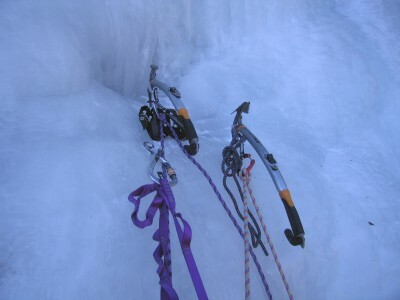 ), but as our confidence grew through climbing the increasingly difficult ice we decided to go up and take a closer look at it. Route 7 (Rastafarice) seen from the valley road. We circumvented the lower rock cave by a new "route" through rock & forest on the left linking up to 120m WI6 ice above the cave. I remembered seeing a few photos from the Petzl team's visit to the valley in 2004 that reminded me of the cave. As we got closer to the cave we could also see a few slings hanging from the roof, but that didn't change our mind - we didn't have a chance to climb it! It was also clear that we couldn't circumvent the cave on the right, but the left looked climbable. Carsten approaching the overhanging rock cave. In 2004 Stéphane Husson made the first ascent of the route (including drytooling the cave) which he graded WI6/"M-hard". Move the mouse over the picture to see our alternative first pitch through the rock and forest left of the cave. 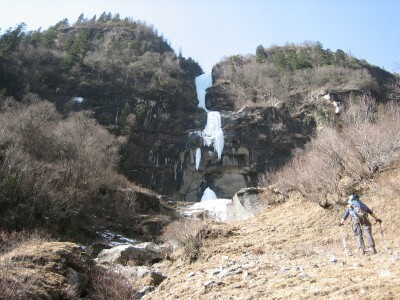 Click on the picture to download his description of the route from the 2005/6 Petzl catalogue. We thus walked into the forest left of the cave and made a belay below a M3-4 rock section which Carsten lead. Afterwards he climbed up- and rightwards through forest and a few rock-sections until he reached a ledge right above the cave. In theory we could reach the ice above the cave from this ledge, but the traverse on steep rock from the ledge to the ice looked dodgy and hard to protect, so instead we looked for an alternative solution. Carsten leading a M4 rock section on the first pitch. We thus went left on the ledge and found a rock slab (M4) leading upwards, which Carsten lead using pins and a tree for protection. He yelled with excitement when he reached the ice above the cave - we had now opened a way to climb the steep ice above the cave. He also yelled that the ice above looked really weird and hard. It had taken us too long to climb the first pitch and we thus decided to fix the ropes and come back the next day to finish the climb. Martin jumaring up the fixed rope on day 2. This evening Ricka became the first to go down..... The next day Carsten volunteered to stay home and look out for her and also stated that I would have a much better chance to finish the climb with Martin as he didn't want to lead the steep weird ice above the cave. I felt kind of sad with this proposal, as I would like to finish what we started together, but it was his choice and I knew that Martin would be an excellent partner. Hans leading the first ice pitch. Weird ice with a cauliflower/mushroom in the middle and a "hard-to-protect" curtain in the upper half. Martin and I thus jumared up the fixed ropes the next morning. We could only see the first ice pitch which I led. The first half was relatively easy, but then the ice got really weird. First I had to circumvent a cauliflower/mushroom/flake section to the right, which then forced me to traverse back left on ice covered with some weird white sunbleached-like ice on top of it. 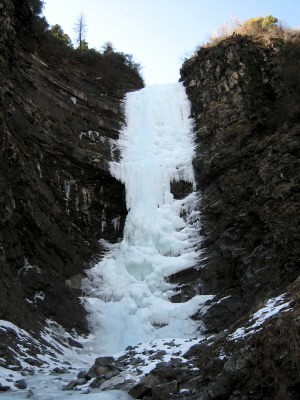 After that I climbed straight up on an ice curtain, which was hard to protect (= non-protected more or less). It was quite demanding and I was running out of mental energy, but nevertheless I got to the top of it. The second ice pitch which was even weirder than the first ice pitch. Martin began on the left side until he reached a huge cauliflower/mushroom which he circumvented on the right. Traversing back above the mushroom, he climbed a freestanding "hard-to-protect" curtain until he reached better ice 2/3-way up. Move the cursor over the picture to see the route. Martin climbing the huge flakes at the bottom of the pitch. Hard to find a protectable and safe way through that mine field. 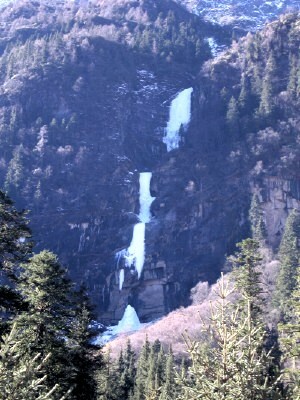 The next section was a freestanding vertical curtain of airy ice. Martin put in a reasonable good screw below the section and began climbing, but halfway up he retreated back to the screw - it was clear to me that this section was really hairy. He yelled down that it was impossible to protect the section and I tried to give him some comfort by suggesting that he just put in another screw as far up as possible and then climbed the vertical section without any further protection. He thus put in another screw for the other half rope and started climbing again, but halfway up he retreated again..... I thought "OK, that's it - this is just too suicidal for us", but I made a final suggestion that he should try the ice 1-2 meters left of him, as it looked more solid from my position. Martin gave it a last try and this time he continued all the way to the top of the ice curtain. Needless to say, I was quite relieved when I saw him put in another screw in the much better ice above the curtain. 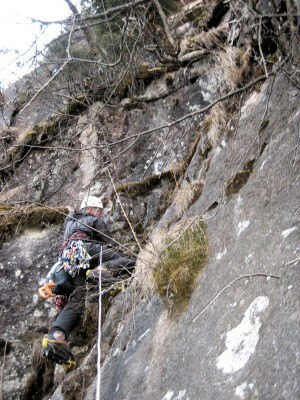 Martin on the crux "hard-to-protect" freestanding curtain. Scary stuff, which he needed three attempts to climb. 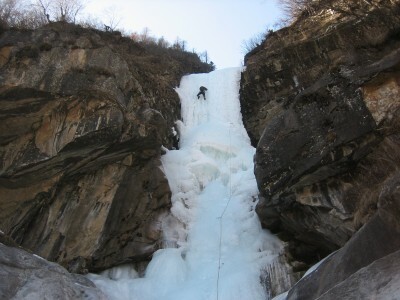 We had planned to climb the whole ice fall in one pitch and Martin thus continued climbing. 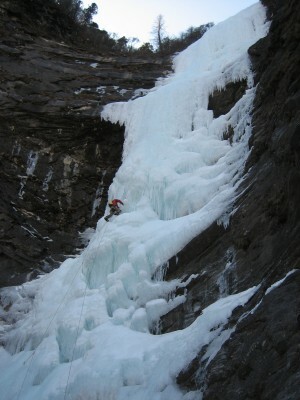 I soon ran out of rope and thus took down the belay and began walking towards the ice while keeping the rope tight. The ice above was still demanding and Martin was running out of screws, but he just kept going! He had almost made it all the way to the next flat section when I yelled that he would have to build an anchor as I had reached the flake section. Martin was running out of ice screws and thus ended up building a belay like this..... Good that the ice above the anchor was easy so we didn't have to test the anchor! He built the anchor with his ice tools and one screw and I then began climbing. 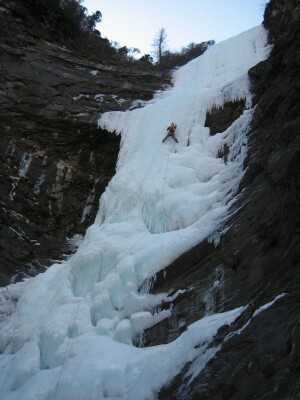 It was some of the most interesting and fun ice I had ever climbed - in particular the overhanging flakes were lots of fun moves, which I could play with in safety as second. 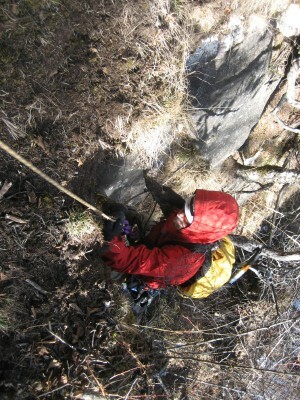 We actually continued for another ropelenght, but the steep part was over and we thus began rappelling. Wauw - what a great route!